I have always known I wanted to work with children, enjoy the arts and sciences, and get a sense of fulfillment from helping people in need. Dentistry was the perfect combination of all three, and pediatric patients make the work more fun! I feel lucky to have found such a perfect career where I am excited to go to work every day. There is nothing I love more than telling a child he or she has no cavities. I love how I get to teach children from a young age what they can do to maintain a healthy mouth, and share in the satisfaction they feel when they do. 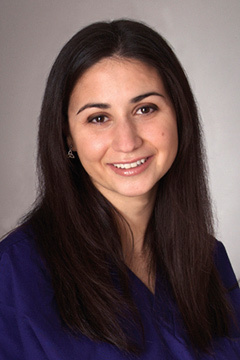 I graduated from the State University of New York at Buffalo School of Dental Medicine. I spent a year in a general practice residency at Westchester Medical Center, where I learned to treat all kinds of patients, from newborns to the elderly. While the experience I gained there was invaluable, my real passion is working with children. I completed my pediatric dental training at the University of Buffalo/Women and Children's Hospital of Buffalo. 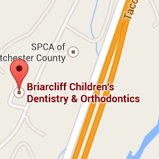 In addition to being a part of Briarcliff Children’s Dentistry and Orthodontics, I am also on staff at Westchester Medical Center, where I am an attending in the department of Dentistry/Oral-Maxillofacial Surgery. There, I volunteer teaching pediatric dentistry to the dental residents. Every member of our team works together very well. Patients at our practice are not just one doctor’s patients, but everyone’s patients — from the doctors to the assistants to the front desk. Having everyone involved in each patient’s care allows us to work and think together to come up with the optimal treatment for each child. We have all spent many years working with children, and are all very patient and understanding of a child’s needs and the best ways to make each child feel comfortable and have a good time. I grew up in White Plains, New York, spent my school years in New York City and Buffalo, and moved back to the Westchester area in July of 2011. My free time is devoted to traveling, reading, swimming, and photography. I am thrilled to be making dentistry fun and providing the foundation for a lifetime of healthy smiles for the children of my community.